Tasks for teachers of English that help to develop language awareness and invite consideration of the pedagogical implications and classroom applications. This second edition has been fully revised and updated, incorporating recent developments in language description, whilst keeping the organisation and structure of the successful first edition. 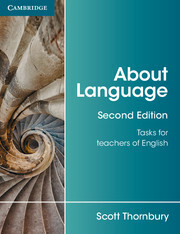 As before, the book asks: 'What is it that a teacher needs to know about English in order to teach it effectively?' It develops teachers' language awareness through a wide range of tasks, which involve them in analysing English to discover its underlying systems. The book consists of 31 units, with new material focusing on varieties of English, models of grammar, phraseology, and spoken grammar. Suitable for use on training courses and for self-study.